You know your commercial building must have a roof—but did you know that roof can save you money? If a metal roof presides atop your facility, you can save up to 30 percent in your annual A/C costs with a high-quality metal roof coating. Commercial metal roofs can reach temperatures of up to 180 degrees, which makes your building’s A/C system work overtime. However, if you apply a reflective metal roof coating, they keep away harmful UV rays instead of absorbing the outdoor heat, and this lowers the temperature of your roof by up to 60 percent. By having a roof coating system professionally applied to your metal roof, you can quickly reap the benefits in utility cost savings and the overall performance of your roof. 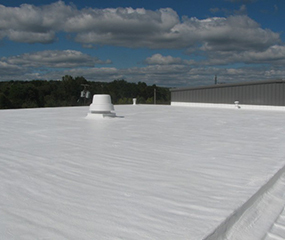 Roof coatings are also long-lasting and much more cost-effective than replacing a roof; instead of an expensive and labor-intensive roof tear-off, your existing roof can be restored to like-new condition with an outstanding roof coating system. 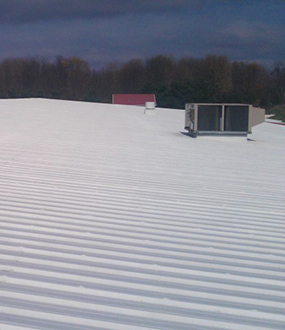 To find out if your commercial roof is a good candidate for a metal roof coating, give the team at E&E Construction Company a call today, (740) 331-0695. No matter what problems your metal roof is having, the expert team at E&E Construction can address them and do the job right. 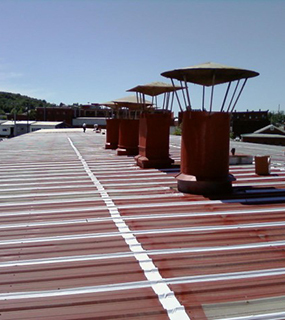 A roof coating system may be the perfect solution—call us today to find out if your commercial roof is a good candidate! Systems stretch and contract with fluctuating temperatures. We also offer non-prorated warranty options that extend up to 20 years, and our top-quality roofing systems are backed a national reputation of excellence that spans over 35 years. These systems provide the most advanced leak resistance, building protection, sustainability and eco-friendliness on the market! Add years to the life of your roof with a metal roof coating system from E&E Construction! Give us a call today at (740) 331-0695 to find out if your commercial roof is a good candidate for this cutting-edge solution. One of our professionally trained technicians is standing by to assist you!